Paul Proulx has always had an ear for sound. And now his work has crossed-over the commercial divide and is being shared on iTunes. 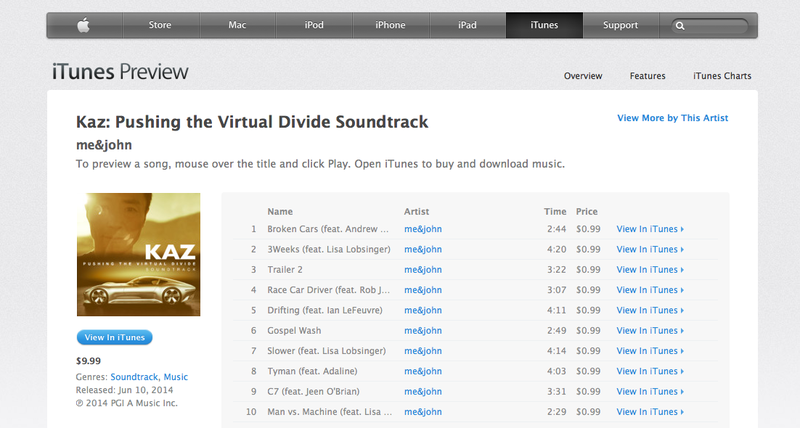 Sony PlayStation has released the soundtrack to the Proulx-edited film, “KAZ: Pushing The Virtual Divide” on iTunes for purchase. KAZ is a recent Tamir Moscovici/Paul Proulx collaboration, commissioned by Sony PlayStation. The feature-length film documents the passion and creative drive of Kazunori Yamauchi, the genius behind video game giant, Gran Turismo. Proulx is a recent addition to the Rooster Post Production line-up. Tamir Moscovici is a director with Spy Films. Through the support of PlayStation, KAZ showcases the journey that forever changed the gaming and automotive landscape, as it redefined how people perceive the relationship between art, entertainment and culture. The film has already gained traction on the awards-front, winning Gold at the Gaming Marketing Summit and a Merit at The One Show. KAZ has been suggested by Strategy Magazine, to be in the running as a likely contender in the Film – Branded Content category at the 2014 Cannes Lions. Also in the running is another Rooster Post Production project for Red Urban and Volkswagen Canada, “Once More: The Story of VIN 903847” VIN was directed by Untitled Film’s Hubert Davis and edited by Rooster Post’s Paul Jutras. This entry was posted in advertising, Branded Content, TV Campaign, Uncategorized, video games and tagged #2014CannesLions, #2014CannesLionsContender, #BrandedContent, #documentaries, #iTunes, #SonyPlayStation, #Soundtrackfirsts, #Soundtracks, #StrategyMagazine on June 17, 2014 by Rooster Post Production.